Sunrooms are great addition to any home. Porch enclosures and sunrooms can be considered complete additions to your home, increasing the square footage and the value of the home. In addition to increased value, sunrooms can be enjoyed year round filling your home with natural lighting. We understand any addition to your home can come with a lot of questions. We want you to rest assured that the experts at The Window Source have the experience and products to give you the sunroom of your dreams. The Window Source Atlanta believes in upfront pricing. A porch enclosure sunroom can vary in price from $5000 to $10000 + depending on the size and specification. To get a price from The Window Source Atlanta, we will schedule an expert to come take a look and talk with you about the ideas you have in mind. We take measurements, show you the products we offer and give you a written price. We require a 50% deposit to start the project and we also offer financing options, including 12 months same as cash* (with approved credit). A common misconception about sunrooms is higher energy cost. This is simply not true, here is why our energy package will actually save you money on your energy cost. 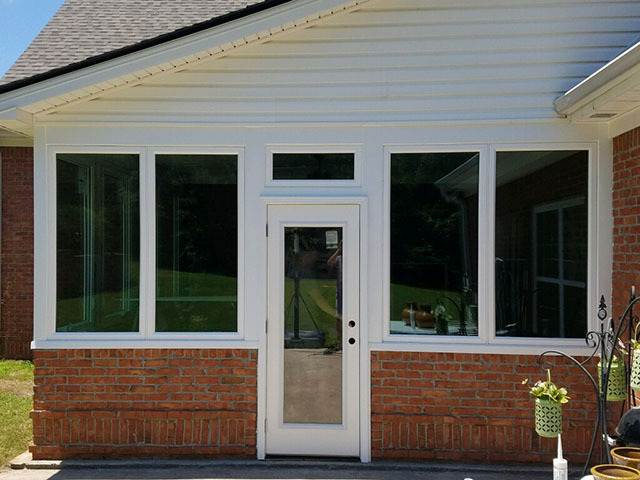 A sunroom installed by The Window Source will never increase the energy cost in your home, not even in the scorching Atlanta heat. You will be able to enjoy a consistent temperature in your new sunroom year round. Sunrooms with a lifetime warranty mean more living space and added square footage to your home, without a high maintenance cost. It’s no surprise that The National Association of Remodelers 2008 survey concluded that a sunroom additions retain 92% of the value when selling the home. https://budgeting.thenest.com/sunroom-addition With a sunroom, you can enjoy more living space in your home and relax knowing you can recoup your investment if you ever sell your home. Yes! A sunroom from The Window Source includes a lifetime transferable warranty. This covers products and labor. From screen replacement to seal failure, you are covered top to bottom for a lifetime.